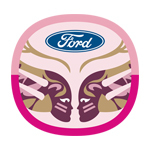 During the month of October, which is Breast Cancer Awareness Month (an annual campaign to increase awareness of the disease), you can visit doctoroz.com/warriorsinpink to enter the Ford Warriors in Pink In the Driver’s Seat with The Dr. Oz Show Fusion Giveaway for a chance to win a 2015 Ford Fusion. Simply visit the site and connect with Facebook to easily import your profile information or complete all required fields in the entry form and click “Enter Now” to receive one (1) entry into the giveaway for your chance to win. Please note that you may submit only one (1) entry during the Sweepstakes Period. In order to participate in the Promotion, entrants must be legal residents of the 50 United States and District of Columbia who are at least eighteen (18) years of age or older as of date of entry with a valid driver’s license. As mentioned previously, the Promotion will run during the month of October, beginning at 12:00 AM ET on October 6, 2014 and ending at 11:59 PM ET on October 31, 2014. One lucky winner will drive away in a 2015 Ford Fusion. The Approximate Retail Value of the vehicle is $35,000 and is based on the Manufacturer’s Suggested Retail Price of a base model 2014 Ford Fusion.